Green shoots in the real estate market? 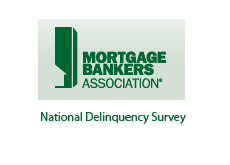 Not so, according to the Mortgage Bankers Association's National Delinquency Survey. According to the MBA, approximately 14% of all mortgage loans on one-to-four-unit residential properties in the United States are either delinquent (at least one payment behind) or in foreclosure. This is the highest ever number recorded in the National Delinquency Survey. Despite a recent upsurge in the stock market and proclamations that the "Great Recession" is now behind us, delinquency and foreclosure rates continue to rise in the United States. According to the Mortgage Banker's Association, the non-seasonally adjusted delinquency rate increased to 9.94% in Q3, up from 8.86% in Q2 2009. The seasonally adjusted rate came in at 9.64%. 4.47% of the residential mortgages included in this survey were in the foreclosure process by the end of Q3 2009, up from 4.3% in the previous quarter. According to the survey, the increases were driven by prime fixed-rate and FHA mortgages. So what's going on here? Why are delinquencies and foreclosures still on the increase when the economy has apparently exited a recession? The national unemployment rate is still on the rise (10.2% as of last month), despite the fact that the recession may technically be over. If people are out of work, then they will have trouble paying their bills. It's as simple as that. Forget the positive news blurbs about increasing new home sales or realtor associations breathlessly talking about "green shoots" in the real estate market. It's all about jobs, and things won't really begin to stabilize and move higher until people get back to work.